Today, just days after notorious tipster Evan Blass posted the first renders of the TalkBand B5 which revealed only a small design evolution over the previous-generation product, Huawei's latest hybrid wearable has gone official in China. Keeping with tradition, the new TalkBand B5 once again resembles a traditional fitness tracker at first glance and includes a 1.13-inch touch-sensitive AMOLED display that features 2.5D glass on top. However, adding to the uniqueness of the product, the display is actually a separate module that can be popped out of the band at any time and placed within the user’s ear. From here, it will act as a Bluetooth headset, allowing owners of the wearable to answer or make phone calls via a connected Android or iOS device. 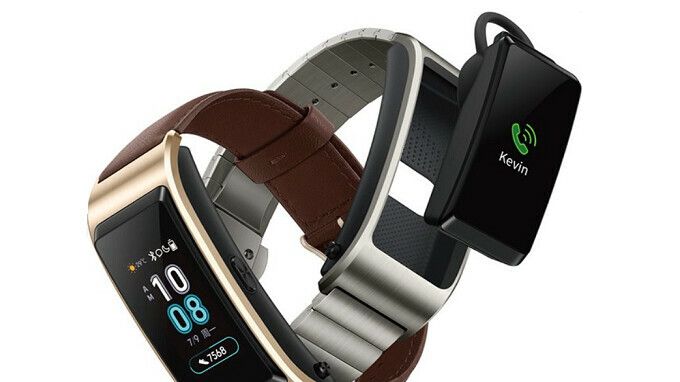 Speaking of which, Huawei has confirmed that the TalkBand B5 is compatible with all Android devices running version 4.4 or above, or iPhones with iOS 9.0 or above. However, the company has confirmed that certain features such as caller ID or the ability to mute calls will be restricted to owners of Huawei or Honor smartphones with at least EMUI 4.1 (Android 6.0 Marshmallow). Aside from the headset features, the Chinese brand’s latest product also includes a variety of fitness-related options such as 24-hour heart rate monitoring and the ability to track activities such as running, walking, and cycling. Furthermore, individual goals can also be set and, in order to track other sports such as swimming, the wearable includes IP67-certified water and dust resistance. In terms of availability, Huawei has confirmed that the pricing will be announced next week, on July 18, with sales commencing just two days later in China on July 20. Additionally, while no information has been provided in regards to an international launch, other markets should begin receiving the product by the end of the summer.